Tracheal mites, parasites of the honey bee, were first discovered in South Carolina in the Mid-1980’s. The mite has since spread throughout all regions of our state, leaving behind thousands of dead bee colonies. The tracheal mite is suspected of playing a major role in causing excessive statewide colony losses in recent years with losses reaching 80%. Tracheal Mites (Acarapis woodi) were first discovered in 1919 on the Isle of Wight in the English Channel and were originally believed to be the cause of Isle of Wight disease which caused great colony losses. The Federal Honey Bee Act of 1922 was passed primarily to prevent spread of the mites into the United States. 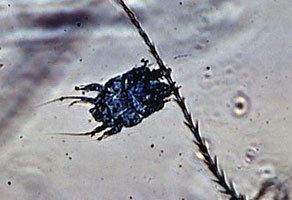 In 1980, tracheal mites were discovered in Mexico, about 200 miles from the Southern U.S. border. USDA, APHIS, in cooperation with the Bioenvironmental Bee Lab at Beltsville, conducted a national survey for tracheal mites from 1980-82. Mite survey results were negative with samples collected from 4,400 apiaries. On July 3, 1984, tracheal mites were first detected in the United States from bees sampled from a commercial beekeeping operation in Weslaco, Texas. Mites spread quickly throughout the U.S. by the movement of migratory beekeepers, sale of queens, packages and nucs. Much confusion exists in the U.S. as to the economic importance of this pest. Bee scientists located in Weslaco, Texas where the mite was first discovered have a difficult time maintaining mite levels high enough to conduct research. Florida beekeepers report minimum losses caused by the tracheal mite while other states report extreme devastation attributed to this parasitic mite. Bee management costs have increased for most beekeepers due to having to replace dead colonies and purchase pesticides for tracheal mite control. These increased costs will have to be passed on to fruit and vegetable growers who rent hives for crop pollination. Increased management costs and rental fees, reduced honey production and pollination, and discouragement experienced by many beekeepers have resulted in a negative economic impact caused by tracheal mites in South Carolina. Tracheal mites are microscopic in size (as long as 1.5 times the diameter of a human hair) and spend their entire life cycle within the tracheae (breathing tubes) of adult honey bees. Female mites lay single eggs in the bees respiratory tract where the developmental cycle occurs. Each female mite lays five to seven eggs 3 or 4 days after entering the tracheae and the eggs require three to four days to hatch. Adult mites (5-9 days old) emerge from their host tracheae in search of a new host. Within 24 hours after the worker bees emerge from their cells, female mites collect within their tracheae. Studies have found that highest number of mites are found in 11-12 day old adult bees, and mite levels decline over 21 days old. Adult mites penetrate the tracheal wall with their piercing mouthparts and feed on bee blood. Normal thoracic tracheae are clear, colorless, or pale amber in color. Severely infested tracheae are darkened with crust-like lesions and may appear black. Numerous mites in varying stages of development and mite debris inside the tracheae are thought to reduce capacity for airflow. Adult female tracheal mite suspended from honey bee hair. (400X) Courtesy of Tom Webster. Bee scientists have discovered a connection between tracheal mite infested bees and flight muscle damage. Flight muscles of mite infested crawler bees are degenerated which affects the ability to fly. Also, blood tests from mite infested bees show a higher than normal bacterial count. Drifting bees between hives, and swarms produced from infested colonies are ways mites are naturally spread within an apiary and between apiaries. Mites are spread within a colony by bee contact. Mature female mites exit the bee trachea and climb to the tip of a body hair. Upon contact with a newly emerged bee, the mite transfers to the hairs of the new host and enters the trachea where it will complete it life cycle. If the mite fails to locate a new host within 24 hours, it will die. The tracheal mite population may vary seasonally. During the period of maximum bee population, the number of bees with mites is reduced. No one symptom characterizes a tracheal mite infested colony. Tracheal mites are believed to shorten the life span of adult bees, affect flight activity, and result in a large number of crawling bees that are unable to fly. The wings of mite infested bees are often disjointed with the hind wing projecting 90° from axis of the body. However, absence of these symptoms does not necessarily indicate freedom of mites. Infected colonies may not develop normally and may exhibit symptoms of dysentery and an excessive swarming tendency. Often, however, severely infested colonies typically appear normal until their death during the winter. Colonies are most affected during winter confinement and early spring like a stress disease. Mite infestations are at a maximum in the spring when the population is comprised of primarily older bees. The susceptibility of worker honey bees to tracheal mites diminishes rapidly with age and bees over nine days old rarely become infested. Studies have shown that adult female mites transfer preferentially to young bees less than 4 days old, and newly emerged bees, less than 24 hours old, are especially attractive. Research is being conducted to determine variations in tracheal mite susceptibility among U.S. bee stocks. Positive diagnosis can be made only by microscopic examination of honey bee tracheae. In sampling for this mite, one should try to collect either bees that may be crawling near the hive entrance or bees at the entrance as they are leaving or returning to the hive (50 bees per colony sampled). These bees should be placed in 70% ethyl or methyl alcohol as soon as they are collected. Do not collect bees that have been dead for an unknown period because they are less than ideal for diagnosis. For dissection, each bee should be grasped between your thumb and forefinger, remove front pair of legs and head by pushing them off with a scalpel or razor blade in a downward and forward motion, cut thin transverse section of the prothorax containing the major tracheal trunks with a sharp razor blade, soak disc section overnight with 8% solution of Potassium Hydroxide in water to dissolve muscle tissue, and examine disc sections with a microscope (Minimum 40X. 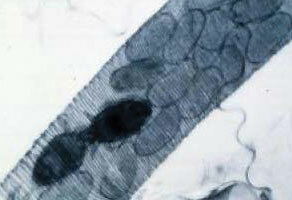 Infested tracheae have various stages of mites and are usually discolored and darkened. Menthol. Menthol crystals provide a fumigant action that kills tracheal mites without harming the bees at certain temperatures. The crystals start to evaporate about 70°F and will melt to a liquid at about 102-105°F. The vapors are heavier than air and best evaporation rate occurs between 80° and 85°F. Menthol crystals were registered as a pesticide for tracheal mite control in the U.S. in January, 1989. Varying degrees of mite control have been achieved with menthol treatments in the U.S. Effectiveness of the product is dependent upon temperature, formulation (crystals or pellets), dosage, colony, size, condition of equipment, position, within the hive and exposure time. Menthol should be used during a non-nectar flow period and after surplus honey has been removed to prevent menthol-flavored honey. Fifty grams (108 oz) of crystals in 7-inch square porous packet should be placed on top frame bars in the brood chamber if the temperature is below 80°F. If the temperature is 80°F or greater, the packet should be placed on the bottom board. Replace packets in the hive with fresh material as needed to maintain menthol in the hive for the specified treatment period. Remove all menthol packets from the hive in 10-12 weeks following the initial treatment. Remove all menthol packets at least one month prior to a nectar flow to prevent contaminating marketable honey. Menthol crystals may reduce brood-rearing and affect clustering behavior if left on the colony beyond the recommended treatment period. A combination of menthol crystals and vegetable shortening-sugar patty treatments should give optimum mite control. In South Carolina, many beekeepers have reported excellent mite control with menthol packets placed on the bottom board in August and removed in November. Results may vary depending on local conditions. A yearly fall treatment should reduce the mite population and allow good over-wintering and good spring buildup. Vegetable Shortening-Sugar Patty. A vegetable shortening-sugar patty treatment has been shown to provide good tracheal mite control. This treatment is thought to disrupt the tracheal mite life cycle by reducing the ability of the female mite to detect young bees as hosts. The patties are made of two parts granulated sugar and one part vegetable shortening. A baseball size patty should be flattened and placed on the top frame bars in the brood chamber. The patty can be placed on wax paper over the top frame bars, but this is optional. Patties should be placed in colonies during brood rearing periods. A fall or early spring treatment or both is recommended. Tracheal mites require their host to survive. Empty equipment that has been free of live bees for one week may be reused without mite treatment. In order to protect people and the environment, pesticides should be used safely. This is everyone’s responsibility, especially the user. Read and follow label directions carefully before you buy, mix, apply, store or dispose of a pesticide. It is a violation of State and Federal Laws to use pesticides in a manner inconsistent with its label. Pesticides recommended in this publication were registered for the prescribed uses when printed. Pesticide registrations are continuously being reviewed. Should registration of a recommended pesticide be canceled, Clemson University would no longer recommend it. Shimanuki, H. and D. Knox. 1991. Diagnosis of Honey Bee Disease. USDA, Ag. Handbook No. A-690, 5 p.
Collison, C.H. 1990. Tracheal Mites Past-Present- Future. ESA Journal Vol. 17, No. 3 pp. 5-6. Skinner, J. 1991. Tracheal Mites in Tennessee. E & PP Info 952 p.
Prepared by William Michael Hood, Extension Entomologist/ Associate Professor, Department of Entomology, Soils, and Plant Sciences, Clemson University. This information is supplied with the understanding that no discrimination is intended and no endorsement by the Clemson University Cooperative Extension Service is implied. Brand names of pesticides are given as a convenience and are neither an endorsement nor guarantee of the product nor a suggestion that similar products are not effective. Use pesticides only according to the directions on the label. Follow all directions, precautions and restrictions that are listed. EIIS/AP-4 (New 01/2000).